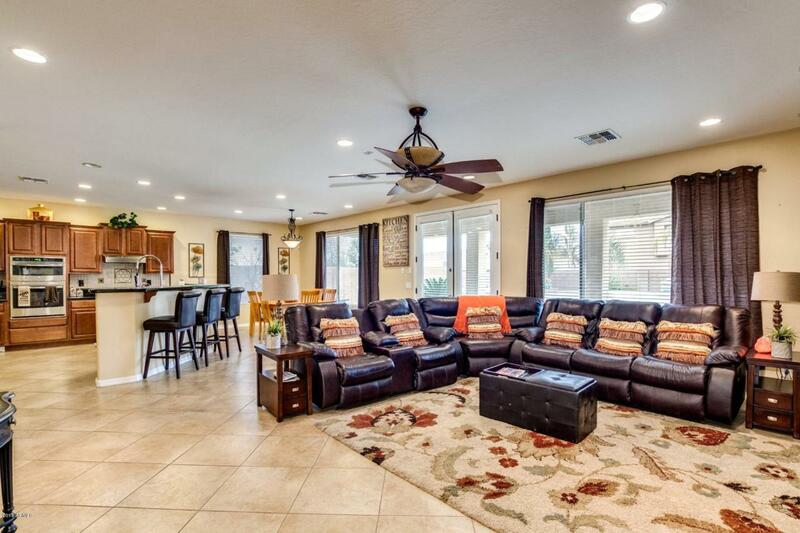 Magnificent two-story home in the highly desirable Seville Golf Community - COMMUNITY Pool, Amazing Views of San Tan Mountains! Fabulous MULTI-GENERATIONAL layout! Over 4,800 square feet this home features a 4 Car Garage, an RV gate, 5 HUGE bedrooms + DEN + GAMEROOM and two are Master ensuite Bedrooms. Through the front courtyard you are greeted w/soaring ceilings, with elegant tile and stunning rich wood flooring. The Kitchen/Great Room combo is complete with a beautiful stone fireplace, granite countertops, Stainless Steel appliances, sleek fixtures, a double oven, tiled backsplash, warm wood cabinetry and a large island. Out back is an entertainer's dream with a private spa, custom firepit, built-in BBQ, pavers and ample space for your guests. Add this one to your must see list today!